Forget Black Friday. Get a great deal on this Sam Jenkins mystery every day. IT’S FREE ! Prequel to all the Sam Jenkins mysteries. 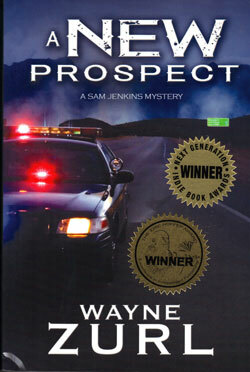 Meet Sam, Kate, Bitsey, and the entire cast from Prospect PD for the first time.? In true Jenkins style, Sam turns common police practice on its ear to insure an innocent man doesn’t falls prey to an imperfect system and the guilty party receives appropriate justice. A NEW PROSPECT takes the reader through a New South resolutely clinging to its past and traditional way of keeping family business strictly within the family. A NEW PROSPECT has received Eric Hoffer (2012) and Indie Book Awards (2011). It was a finalist for a First Horizon Book Award and a Montaigne Medal. Three weeks earlier my friend, Adolph, an urologist from New York, sent me a free sample of a half-dozen Cialis tablets. At 6:30 I popped one, thinking that Kate’s promise of a snuggle wasn’t just an idle comment, but sort of a bonus for going out and getting myself real job. Sitting in the restaurant, I remembered the TV commercial—the one where two lovers sit in separate bath tubs on the south rim of the Grand Canyon, looking off into the sunset. Weird but memorable. Following the instructions from that commercial, I didn’t indulge in excess alcohol consumption after taking Cialis. I drank one twelve-ounce draft of Dos Equis. Kate, who didn’t have to worry about any warning, ordered a bowl-like glass of frozen Margarita. After getting a little giggly she held my hand on the way home. As I topped a hill on US 321, I noticed an old Ford Tempo in the turning lane waiting to make a left onto Gateway Road. Five or six cars coming from the opposite direction prevented the Tempo driver from doing that. A short break in the cluster of westbound vehicles opened up before the last car would pass the Tempo. For some ill-fated reason, the woman in the Ford began her turn directly in front of a new Camry going at least sixty. The old Tempo didn’t have the pick-up to clear the two westbound lanes before the driver of the blue Toyota, talking on her cell phone, crashed broadside into the right front door of the Ford. Driving in the left lane doing fifty-five, I watched the Tempo propelled backward and at an angle that would quickly intersect with us. I nailed the brake pedal of Kate’s Subaru as hard as I could, immediately pulled my foot back off, and simultaneously threw the steering wheel hard to the right and hit the gas. The little Outback zigged right. I twisted my upper body, now to the left, again jerking the wheel. The car zagged left, avoiding the spinning Tempo. I hit the brakes hard again and brought our car to a squealing stop in the eastbound, right-hand lane. The collision sounded deafening and the squeal of brakes loud and high pitched. I smelled rubber burning as the Subaru came to a stop. I pulled off onto the shoulder of the road, thankful I never forgot what I learned in the Emergency Vehicle Operation Clinic back in 1972. “Are you okay?” I asked Kate, who always wore a seatbelt. She looked up at me, shaken but unhurt. She nodded. People ran out of the house just above where I stopped the car. We had no cell phone with us. “Make sure they call 9-1-1, fast,” I said. She unfastened her seatbelt and ran up the small hill to the lawn where two adults and a teenage boy stood by looking down toward the highway. I jumped out of the Subaru and ran over to the driver of the Ford, the closest vehicle to me. Other people drove by slowly, rubbernecking or stopping to help. A burly, bearded guy parked his pick-up behind the Tempo and switched on his four-way flashers. I jerked open the driver’s door of the Ford—she hadn’t worn a seatbelt. The old car had no air bag. Clearly, her head bounced off both the side window and the windshield causing great spider-like breaks in the glass now pushed outward by the force of the driver’s skull. The woman’s head hung at an unnatural angle, something I’d seen before in similar situations. I placed three fingers over her carotid artery, but had little hope of finding a pulse. I felt nothing. I shook my head, looked at my bearded assistant, and said, “She’s dead, let’s go.” We ran to the Camry. Another car stopped, blocking one lane of traffic. A young man went to the Toyota and tried without luck to open the driver’s door. “We’ll handle this,” I said, pointing at the car door. “Back your car up about a hundred feet and put on your lights and four-ways. No one down the hill can see us up here. Try to get traffic to slow down.” He hesitated. “Do it! Quickly!” He moved. The Camry’s door jammed shut after the front end impact; the side window shattered and broke out completely. I pulled on the door frame. Nothing happened. “Watch out!” the big guy told me. He pulled the door open almost an inch-and-a- half, just enough to get his fingers between the frame and the jamb. With two hands locked around the frame and his foot braced on the side of the car, he pulled again and gave a loud grunt. The door moved. “A li’l he’p here.” He panted, straining against the twisted metal. We positioned ourselves so we could both pull, and on his signal we did. The door moved more, now almost half-way open; enough room for me to squeeze in and get to the driver. I felt for a pulse, found one, and tried to open her seatbelt. The buckle had jammed. I pulled a knife out of my pocket, pressed a button, and the sharp, spring-loaded blade locked open. I cut the lap and shoulder straps that restrained the driver. She moaned. The big guy slapped my shoulder. “Hey!” he said, and pointed to a puddle of gasoline forming around my left foot. I nodded—he knew I understood. He jerked the door open a little more. I put my arm behind the driver’s back and gently drew her toward me. She was young and lightweight. Keyed up from the excitement and with adrenaline pumping through my body, I easily extracted the girl from the car. I had her half-way out when the bearded man took over and hefted the burden from me. We moved forty feet behind the Toyota where he laid her down on the blacktop. The big guy balled up his shirt and placed it under her head. I heard sirens, both nearby and in the distance. There were two types, the screams and yelps of police cars and the steady, high—low sound of a Rural Metro ambulance. I looked up and saw flashing blue lights just behind the Tempo. Another man and a woman who said she was a nurse joined the big guy who comforted our victim. I got up and ran toward the source of the blue light, a white and green county sheriff’s unit. A young cop with a crew-cut and a mustache got out, first adjusting his campaign hat and then his gun belt. He walked slowly toward me. “Jest who the hell you think you are?” he asked, with a dose of attitude. I hesitated for a second, took a step closer, and raised my voice, “I’m the goddamned Chief of Prospect PD. Give me that extinguisher, now!” He hustled back to his car and pulled out an oversized portable fire extinguisher. I pulled the pin, sprayed the puddle of gas, and exhausted the rest of the foam inside the engine compartment, hoping to ward off a fire. The cop watched me. “I told you; get back down the hill with some flares or cones! I don’t want someone parking in your goddamn trunk at sixty-miles-an-hour.” He moved out smartly. Two other police cars pulled up, a county sergeant and a state trooper. I stepped over to the supervisor. “Sarge, you’ve got one DOA in the Tempo, a critical on the ground over there,” I pointed toward the victim, “a nurse is helping her. You’ll need the fire department for a wash-down—gasoline’s under the Camry. You also want a car with lights down the hill to the east, and you might need a couple of guys to direct the traffic.” I began loosing breath. “You done this before?” he asked with a grin, as he unhooked a portable radio from his gun belt. He didn’t know me, but I’m sure he recognized a cop speaking. The sergeant began talking to his dispatcher. As he spoke into the radio, an ambulance weaved slowly onto the scene, the driver looking for a safe place to park. All the pros were arriving. I walked over to the trooper, gave him my name and phone number, and volunteered a witness statement when the county dicks got around to wanting one. I considered my job finished. I crossed two lanes of eastbound traffic trying not to get hit by a rubbernecker. Feeling exhausted, I trudged up the small rise to fetch my wife. Back on the highway, we settled into the car, Kate fastened her seatbelt. I took a deep breath. After a few seconds I switched on the ignition and put the car into drive.